In this article series, we are exploring the capabilities of Oracle Enterprise Manager Cloud Control 13c for the private Database-as-a-Service (DBaaS) cloud – including the setup of such a cloud. In the previous parts, we started the setup of the private DBaaS cloud, including the configuration of the self-service portal. The full procedure includes setting up the Enterprise Manager software library, creating the PaaS infrastructure zones, database pools, and quotas for the users, service templates, and optionally, chargeback plans to apply to the users for cloud allocation and cloud usage. 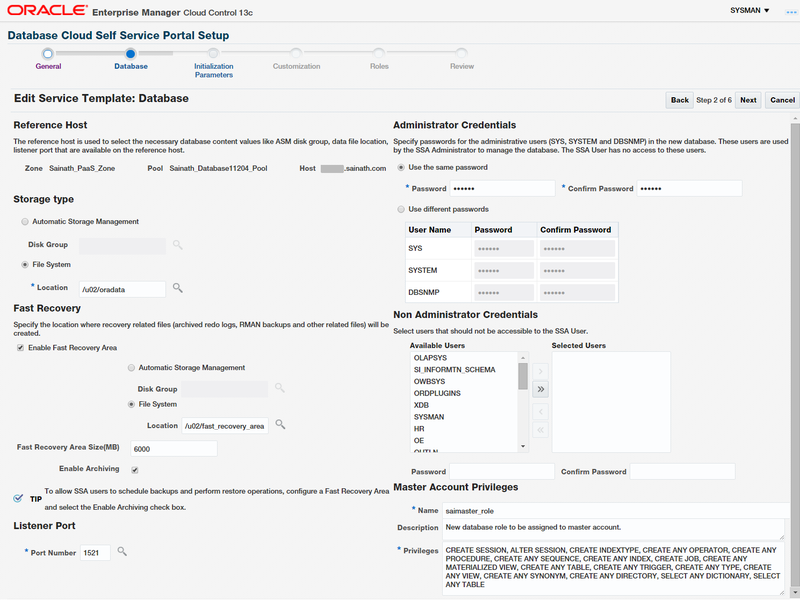 The next step was to create Service Templates for the database cloud, which can then be used by the SSA User to provision databases in the pool. The profiles created in the previous section are like gold copies of an Oracle database, and they are used by service templates. The service template is what is offered to the SSA user and forms the basis of the functionality of the cloud. We created the service templates by selecting Setup | Cloud | Database and then Service Templates in the left pane, followed by clicking on the Create button. We named the service template as “Sainath 11204 Single Instance Database”. Under the Source Identification section, we selected the Create Database as “Using Profile” and then from the list of profiles we selected the appropriate profile that was created with an RMAN Full backup. If “selected by the user during request” is used, then the algorithm doesn’t decide on the member; the human user makes that decision. However, the constraints will still apply. If there are multiple hosts in the pool and the human user selects a host that is already over-utilized, the creation of the new service will not work. So, it is best to leave the selection to the placement algorithm, except in special service catalog offerings where a manual selection of a host is required, for example – there may be a few hosts in your pool with higher performance (more processors and memory available, or a faster storage subsystem), and you want an especially important database to be created on that specific host rather than other hosts with lower grade performance. Or, you want certain databases to be created only on a particular host in the pool, and other databases to be created on any of the hosts. Click on Next. The Database details step appears (Figure 24).